a bird sends seeds to the floor. Over the seas, a bird drops a seeds which sprouts and, slowly, grows into a tree. When that tree is felled it becomes, in turn, part of a ship bearing convicts, then a frame for a weaving loom and, eventually, part of a lean-to. When the lean-to is abandoned the wood lies dormant until a crafter finds it and from it carves a wooden bird. This beautiful story shows the journey of one tree, with the use of the bird at the beginning and end drawing an elegant circle which even young children will connect with. The repurposing of the wood from convict bunk to loom to building material to carving material connects history with the growing contemporary re-awakening of the importance of recycling and upcycling. The poetic text is simple, and a delight to read aloud, and Harris’s illustrations make stunning use of light and perspective. A delight for a home library as well as a useful classroom read. Following the adventures of one young koala as it becomes time for him to separate from his mother and find his own way in the world, Koala is a wonderful blend of narrative and fact. Koala must overcome hunger, predators, natural disasters, and even other koalas before, finally, he finds a new home where he can live safely. Part of the wonderful nature Storybooks series, Koala uses narrative non-fiction to trace the life of a fictional koala, grounded in fact, and supported on each spread by additional facts. The text is lyrical, making it accessible and a joy to read, and the illustrations, by one of Australia’s best-loved illustrators, Julie Vivas, are superb. A must have for Australian homes and classrooms, Koala is also sure to be enjoyed by overseas audiences. All I own in this world is my name: Lizzie Flynn. It’s all I take with me as we are hustled aboard the Rajah, a cargo of convict women. Convict Lizzie Flynn is leaving London, bound for Van Diemen’s Land. All she owns is her name. When the women on the boat are given sewing materials to make a quilt, she is reluctant. She doesn’t know how to sew. But Molly encourages and teaches her, and soon Lizzie a part of the sewing group. By the time the boat reaches Australia, the women of the Rajah, have completed a beautiful quilt and Lizzie has new skills and new friends, though sadly her friend Molly has not survived the journey. 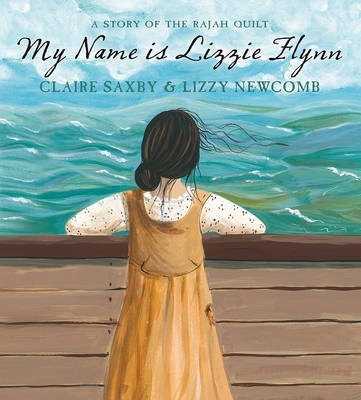 My Name is Lizzie Flynn: A Story of the Rajah Quilt is a beautiful historical picture book, fictionalising the story of the Rajah Quilt, made by convict women in 1841 and now housed in the National Gallery of Australia in Canberra. 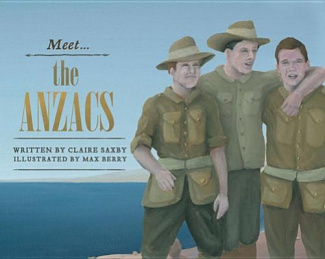 Saxby has a skill for creative nonfiction, and her text manages to convey both the emotions of Lizzie and her fellow travellers, and the essence of the era of convict transportation. The acrylic illustrations again capture the mood, with the drab colours onboard the ship in contrast with the e blues of the seas and sky beyond. In the scenes of land a clever contrast is created by portraying England in grey tones as the women leave it behind and Van Diemen’s Land (Tasmania) with rolling green hills, and gently colourful houses suggesting a level of hope. So begins this delightful rhyming picture offering, a nautical twist on the old rhyme There was an Old Woman, which sees the sailor eat his way through a host of ocean dwelling critters, from the tiny krill, to a fish, a ray, and even a whale. Young readers will love the silliness of the tale, and be able to join in the repetitive rhyme. They’ll also be surprised by the ending, which adults may also approve of, because unlike the traditional rhyme, in this one the eater does not end up dead. The illustrations, in richly muted ocean tones, are beautiful, with lots of comical touches. The sailor’s expressions are especially humorous and endearing. Back of book fishy facts provide a gently educational touch. This is a gorgeous hard cover offering which will sit well in libraries and classroom collections, but be just as loved and treasured at home. This book can be purchased online from (the appropriately named bookstore) Fishpond. Buying through this link supports Aussiereviews. Sheep lived in a grassy green paddock complete with everything a happy, contented sheep could possibly want. But sheep wasn’t happy. Or content. In Sheep’s paddock, there was no Jellagong tree. Sheep is happy living in her paddock until she notices the Jellagong tree in Goat’s paddock. Goat tells her the leaves of the Jellagong tree are delicious – and Sheep wants desperately to taste them for herself. But Goat won’t give her any and fiercely guards the creaking gate between the two paddocks. Finally, Sheep comes up with a plan to trick Goat into letting her in – only to find out that the Jellagong Tree isn’t as good as it looks. Sheep Goat and the Creaking Gate is a gently humorous look at the nature of happiness, exploring the theme of the grass is always greener in a way which will make youngsters giggle whilst giving a subtle message about being satisfied with what you have. Judith Rossell’s illustrations are delightful, using bold greens, blues and yellows to offset the white sheep and brown and white goat, as well as little collage embellishments. This is a beautiful offering which will be treasured by children and parents.